The Dolby Theatre was built as the Kodak Theatre in the Hollywood & Highland Center, which opened in 2001. It is the permanent home of the Academy Awards, located in the heart of Hollywood next to the Chinese Theatre, with the Hollywood Walk of Fame outside its door. Tours are offered daily, except during Oscar preparation. The facade shown here is at the front of the Hollywood & Highland Center. The box office and theatre are actually at the back of the Center, accessed from the inside. Hours: Daily 10:30 am to 4 pm, tours leave every half hour and last about a half hour or longer if people have a lot of questions. Where: Hollywood & Highland, 6801 Hollywood Blvd, Hollywood, CA 90028. Tours depart from the level 2 entrance. The box office is on the first level. Tickets: $20 adults, $16 seniors (65+), and youth under 18, children under 3 Free (strollers will be checked at the door). Discounts: The Dolby Theatre Tour is also included in the Go Los Angeles Card. 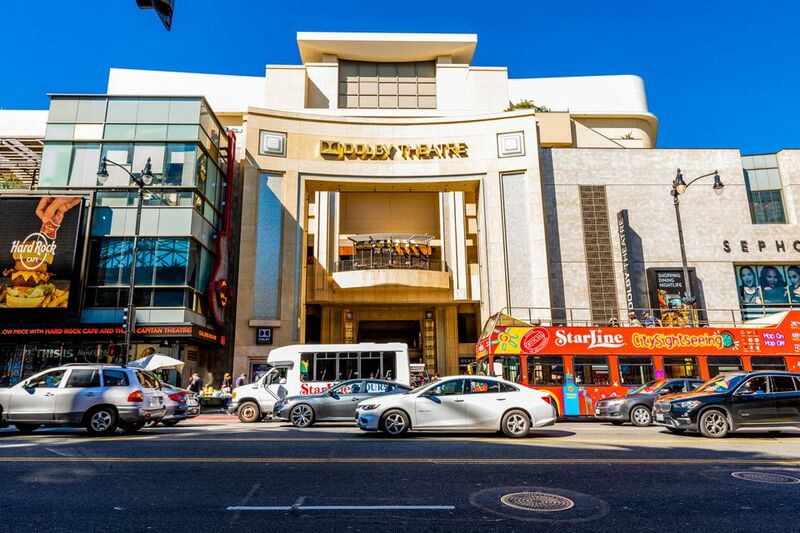 Parking: $2 for the first 2 hours with validation at Hollywood & Highland, $1 per 15 min thereafter. Other parking nearby. Note: Tours are suspended in February for Oscar preparations and occasionally for special events. Check the website for dates. Touring the Dolby Theatre (formerly Kodak Theatre) at Hollywood & Highland Center is an interesting way to spend a half hour in Hollywood. If you're short on time or money, there are other Hollywood experiences with more bang for your buck, but if you're a fan of everything Hollywood or aspire to stand on this stage and accept a little gold statue someday, you might want to invest the money. If you have a Go Los Angeles Card, then definitely try to schedule it in. In 2012 the name changed from the Kodak Theatre to the Dolby Theatre and the venue got a Dolby sound upgrade. Taking photos on the tour is strictly prohibited. But you can get a glimpse inside and more information about visiting on the next few pages. During preparations leading up to the Academy Awards in February, the Dolby Theatre is off limits. The rest of the year, you can go on a half hour guided tour of the facility. The $20 admission is quite steep for taking a look around, but for aspiring stars who have been practicing their acceptance speeches in the mirror since they were small, the chance to stand on the actual stage where so many have received the gold-plated Oscar may be irresistible. It has also been the stage where American Idol contestants belted out their final performances for several years. Since 2001, the Kodak Theatre (now the Dolby Theatre) has been the permanent home of the Academy Awards. Located next to The Chinese Theatre at the Hollywood & Highland shopping and entertainment complex, the theatre hosts concerts and special events when there is no awards ceremony going on. Your tour guide describes the red carpet path that the celebrities will follow from Hollywood Boulevard into the theatre, then leads you through the experience from the bar, to the VIP Room and Green Room and out onto the stage. You can see where your favorite celebrities sat in the steep rows of red seats while they waited to hear if their name would be called. All the while, your guide shares his or her knowledge of Oscar trivia. The 3400-seat theatre was designed to showcase the glamour of Hollywood with multi-tiered box seats rising up each wall and a silver-leafed tiara of lights camouflaging and supporting the lighting catwalk suspended from the ceiling. It probably won't look like the photo above when you see it. This was set up for an AFI Awards Gala with tables all the way up on the stage. One of the highlights of the Dolby Theatre tour is the collection of photos of past Academy Award winners like Grace Kelly, Halle Berry and Jack Nicholson accepting their golden statues. Each floor has an exhibit on either side of the grand spiral staircase. The walkway that awardees traverse to the press area is lined with more of these images.